Harissa has my heart lately – From Harissa Hummus to Lemon Chicken Skewers with Harissa Yogurt Sauce, Harissa has been finding its way into lots of my recipes this summer! Its warm spices and rich fragrance have defined a new style of comfort food for me. Comfort food was traditionally defined by rich, heavy dishes, like Macaroni and Cheese, Short Ribs, or Osso Buco. But today, I’d like to think that the New Comfort Food is just a more healthful, mindful way of eating – Eating to feel good. 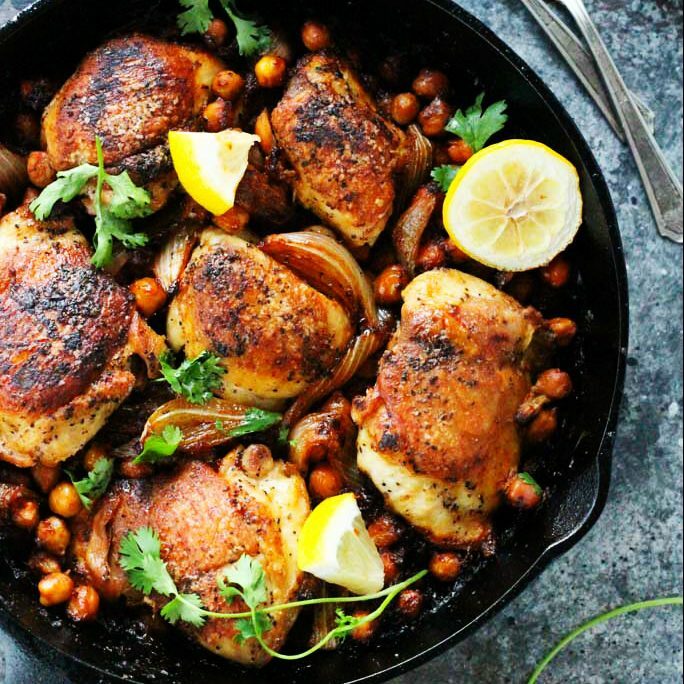 This One Pot Harissa Chicken with Chickpeas and Yogurt is my New Comfort Food – With the rich, spiciness of the harissa, the creamy chickpeas and the tangy yogurt – It’s an all around feel good dish that’s easy to make on a weeknight, but fancy enough to serve at a dinner party. A note about the heat in this dish – Different brands of harissa can have varying degrees of heat. You should taste yours first and modify the amount you use from there. You may need anywhere from 1/8 cup of harissa to ¼ cup. It also depends on how spicy you like your food. I used ¼ cup, and the end result was quite spicy – The way I like it. However, if you’re sensitive to heat, I would definitely dial it down a bit, using half the amount. How do you define comfort food? Are you more traditional when it comes to those dishes, or have you created a “new” comfort food tradition of your own? I’d love to hear your thoughts in the comments below. 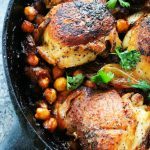 This One Pot Harissa Chicken with Chickpeas and Yogurt is a fuss free dish that's easy to make at home. Spicy, fragrant harissa coats the chicken and chickpeas as they roast and a creamy yogurt harissa sauce finishes it off at the end. In a small bowl combine yogurt, harissa and lemon juice. Season to taste with salt and pepper. Heat oil in large oven-safe skillet over medium-high heat. Season chicken with salt and pepper. Cook chicken for 4-5 minutes per side, until browned. (The chicken does not need to be fully cooked through.) Set aside. Reduce heat to medium and add onion and garlic to the skillet. Cook for 2-3 minutes, until softened. Add tomato paste and allow to brown for a minute or two. Add chickpeas, harissa and chicken broth and bring to a simmer. Return chicken to the skillet and place in oven. Roast for 20-25 minutes, until chicken is cooked through. Top with cilantro and serve with lemon wedges and harissa yogurt on the side. Sauvignon Blanc – Fresh and fruity with abundant citrus and herbal notes, it makes a great match for the tanginess and spiciness of the harissa. A dry Rosé or Riesling would also make a great match for this dish, their bright acidity and balanced sweetness play nicely off the harissa. I need to get myself some harissa! Making this next week for sure. Yay! I’d love to hear back on how you like it Catherine! 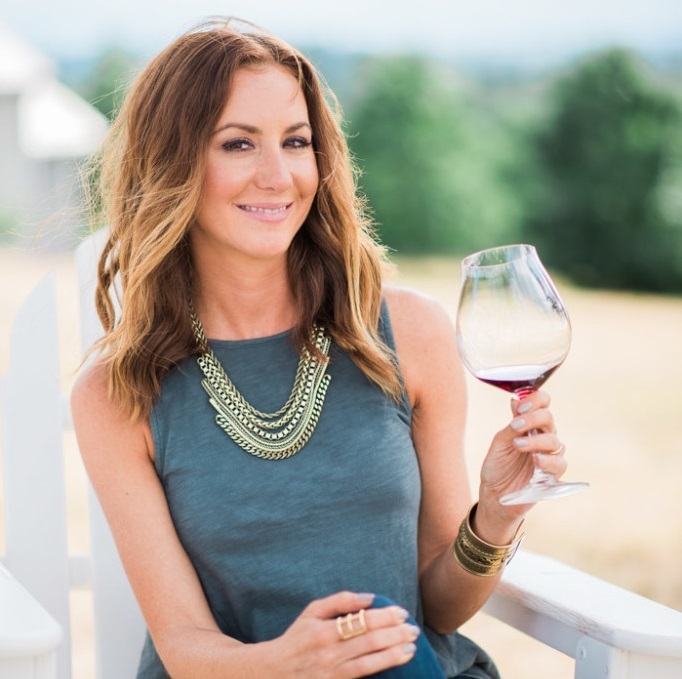 Erin – this looks AMAZING! I don’t how you are constantly coming up with such creative and beautiful recipes. Looks super yummy and love that it’s one pot with minimal clean-up. Thanks so much Lisa! I’m constantly on the quest for more one-pot meals! Everything about this recipe looks amazing! 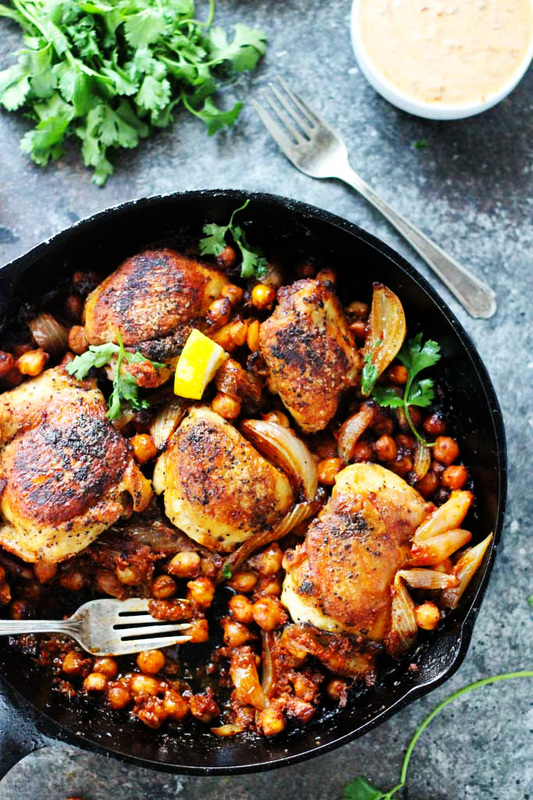 I haven’t cooked with harissa at home yet but this definitely makes me want to run out and get some to try this dish. Yum! Holy crap that looks delicious! I’ve also never tried cooking with harissa at home and now feel the need to go buy some. Totally agree about the rosé too. Would be very refreshing and cooling to the palate, especially if you make it on the spicy side (like I totally would!)!! I definitely lean towards the side of spicy, Mary, so much so that it gives my boyfriend the hiccups… Oops. I love harrisa, and the other flavours you have going on here sound fab. Think I may need to up my game on my weekend tray bake! This recipe sounds great. Would like to try it — but have one question: I’m assuming you use plain yogurt, but how much? Your standard small size or is more required. Hi Mary Beth – I used 6oz. plain Greek yogurt and stirred in 1 Tbsp. harissa paste. You may need to adjust based on the heat level of your harissa and personal spiciness preference. Enjoy! I have Harissa powdered seasoning, can I use that in lieu of the paste? Hi Jean – I would add some oil and water to the powder until it reaches a paste like texture. Hope this helps!